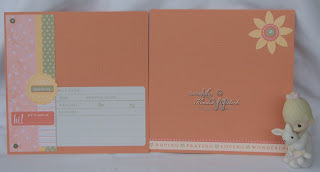 So here are the pictures of the wedding albums I put together. I realize they would look so much better with pictures on the pages, but they are for sale, so I really don't think anyone wants to buy one that is used ~ LOL! There are a total of 12 pages (plus the front & back inside cover). 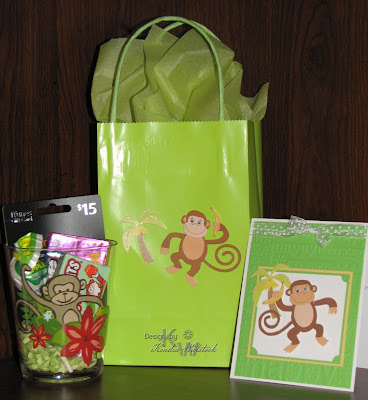 Supplies Used: Stampin' Up! 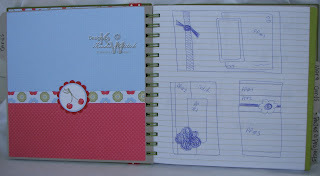 Tie the Knot Scrapbooking Kit. LOL! I messed up & originally posted a challenge card for Hanna Stamps. I thought I was so on top of things and the challenge is for next Friday ~ Oops! So some of you might have seen a peek at it before I pulled it (at least I think it's pulled ~we'll see when I publish this). Anyway, here are a few baby cards I made using leftover pieces from the Baby Girl scrapbook kit. I am putting them with the 6x6 scrapbooks. 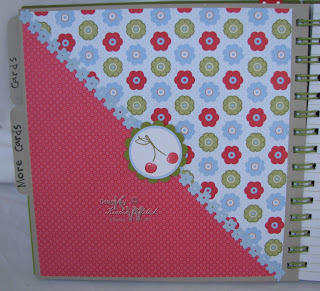 I've been busy working on 6x6 mini scrapbook gift albums over the last few weeks. Stampin' Up! sells these wonderful kits with their gorgeous textured paper, 2-sided pattern paper, and heavy-weight stickers. And the great part is ~ you can get 2 complete 6x6 albums from each kit with a total of 12 different pages (4 of the 12 pages are shown). I also made a matching gift card so it's an easy gift to give the mom-to-be (or new mom) and she can just add her own pictures. A few months ago I made one with the Summer Days album as a class and then I made the baby girl album and posted that last week. So now I have made a baby boy album, a wedding album and a School Days album ~ I love how they all turned out. I have 8 albums ready for my sale this weekend & whatever doesn't sell will go into my new Etsy store when I get home from vacation. I'll share the next two albums over the next few days. 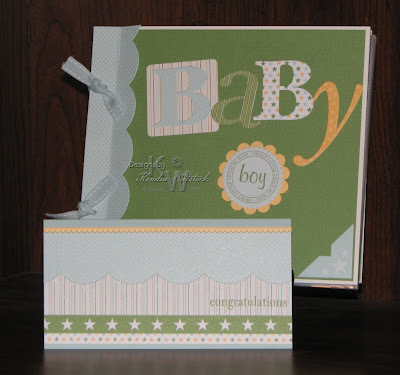 Supplies Used: Special Delivery Boy scrapbook kit, Scallop punch & Ribbon all by Stampin' Up! ; poster board for the cover. Just having a little more fun with my Lizzie Anne Design stamps. This is one of my new favorite color combinations ~ Guava, Brocade Blue, Celery & Saffron. It feels so fresh to me. I've been working very hard to make sure you have lots of eye candy to view while I'm gone on vacation. More to do today so let's hope I can get back into my groove ~ I've been in a bit of a creative slump the last few days. 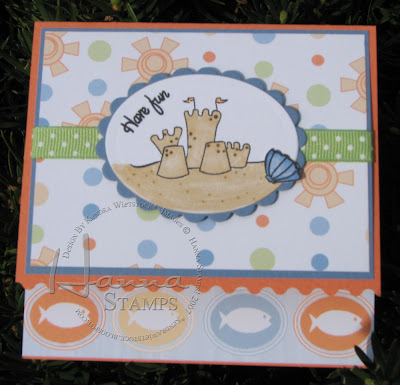 Supplies Used: Stamps ~ Lizzie Anne Designs (By the Sea); Cardstock ~ Stampin' Up! ; Pattern Paper ~ Three Bugs in a Rug; Ink ~ Stampin' Up! ; Ribbon ~ Stampin' Up! It's that time of year to show my kids teachers and the office staff how much we appreciate everything they have done for our kids during the school year. I have many friends who are teachers or work in the schools and I know it can be a very thankless job some times. This year I decided to make a little summer fun for them. Included inside the cup is a gift certificate to Coldstone, a Take 5 candy bar, a few tubs of Crystal Light and some Life Saver candy. I made a total of 10 cups in less than 2 hours ~ so they were not only cute, but they were fast and easy too. 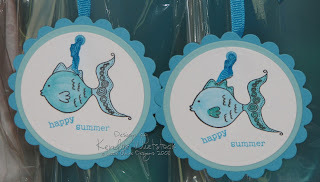 Supplies Used: Stamps ~ Lizzie Anne Designs (By the Sea) & Stampin' Up! 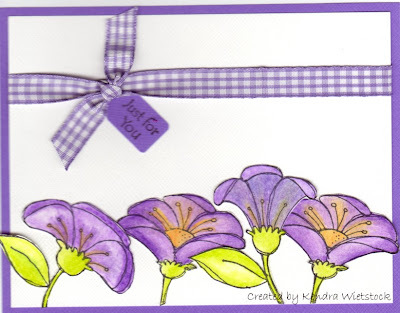 (Aloha flowers); Cardstock & Ribbon ~ Stampin' Up! ; Ink ~ Palette & Copics. I love this little fish! This is another image from the By the Sea set from Lizzie Anne Designs. Cute, cute, cute! Happy Memorial Day! Now I'm off to stamp! I have tons to do before we leave on vacation. 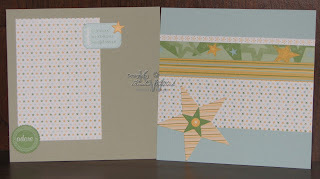 Supplies Used: Stamps ~ Lizzie Anne Designs (By the Sea); Cardstock ~ Papertrey & Stampin' Up! 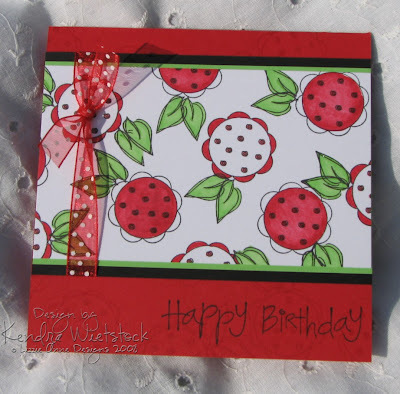 ; Ink ~ Palette, Copics; Nestabilities; Cuttlebug Embossing Dies & Ribbon ~ Stampin' Up! My friend Bev Barton (also known as Bevie Pearl), loves to come up with little challenges. This weekend it was that we had to use Red and Flowers on the same card ~ here ya go Bevie! Supplies Used: Stamps ~ Lizzie Anne Designs (Le Jardin); Ink ~ Palette, Copics; Cardstock & Pattern Paper ~ Stampin' Up! ; Brads ~ American Crafts; Punches ~ Stampin' Up! ; Ribbon ~ Bo Bunny. Matt's friend across that street had a birthday a few days ago & tonight was the Monkey party. I found out she got an iPod from her parents so Matt & I decided she needed an iTunes gift card so she could load it up. But you just have to figure out a way to jazz up those boring gift cards. So while I was at Target yesterday, I found this cute cup and the decals for the gift bag and card. Volia ~ an easy but very cute gift! Isn't she fun? We are ready for the pools to open around here, now we just need the tempratures to get back up so we can actually get in the water. At least we can tell that summer is almost here. It's so wonderful to see green grass and flowers. We have several bird feeders in the yard and today I noticed a gorgeous Blue Bird ~ it was the most brilliant blue (actually Tempting Turquoise) and some amazing Gold Finch. I love to watch them. 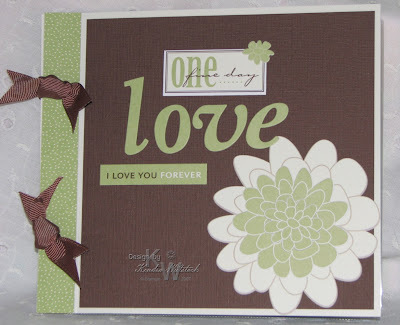 I am loving how this card turned out using the new Le Jardin set by Lizzie Anne Designs. There are gorgeous detailed images in all sizes. It's very fun to play with. The layout for this card was inspired by the 2008 Hero Arts Catalog ~ love that thing! The designers in that catalog are amazing. 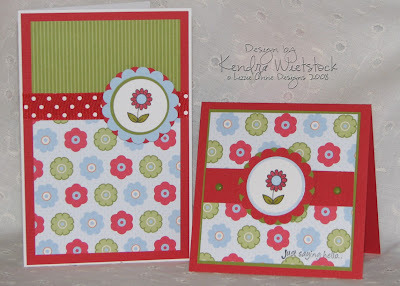 Supplies Used: Stamps ~ Lizzie Anne Designs (Le Jardin); Cardstock ~ Stampin' Up! & Papertrey Ink; Ink ~ Versamark, Palette & Copics; Nestibilities dies; Pearls ~ Pretties Kit by Stampin' Up!. I saw this idea in the Hero Arts catalog and couldn't wait to try it with my Lizzie Anne stamps. I looked through all of my LAD sets and found six Thank You sentiments. I stamped them randomly on vanilla cardstock in Creamy Caramel ink ~ voila ~ I have the perfect pattern paper. Supplies Used: Stamps ~ Lizzie Anne Designs (In the Tree Top, Sketched Sentiments, Funky Floral, Simply Sentiments, Fun to be Floral); Cardstock ~ Bazzill & Stampin' Up! ; Ink ~ Stampin' Up! ; Punches ~ Stampin' Up! 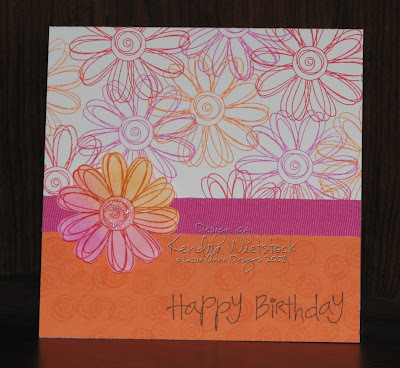 ; Flowers ~ Prima; Brad ~ Stampin' Up! As you can see by my blog roll on the right, I have many talented friends. I have had the honor of meeting most of these girls and talk with many of them on a daily basis (well not Becky or Nichole ~ but that would be fun). I feel so blessed to have such a wonderful group of friends ~ and their talent always blows me away. 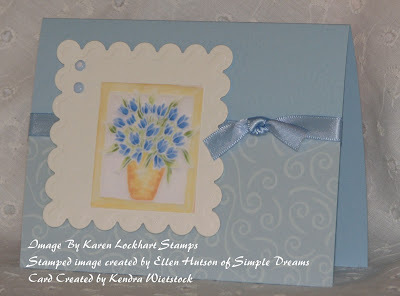 The image on my card today was stamped and colored by my friend Ellen Hutson of Simple Dreams. She sent me this image with my Nestabilities order (from Ellen Hutson, LLC). When I saw this gorgeous image, I had to put it on a card ~ how could I not, her technique is extraordinary! 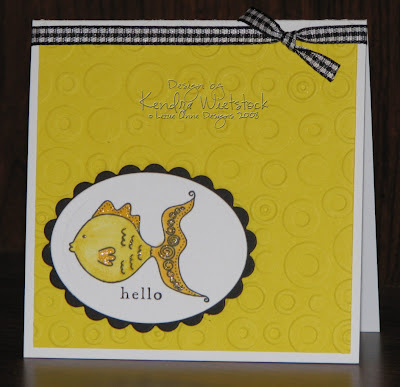 Supplies Used: Stamps ~ Karen Lockhart Stamps; Cardstock, Vellum & Brads ~ Stampin' Up! ; Scallop Square ~ Nestabilities. Image created by Ellen Hutson. I have a To Do List the size of the Empire State Building; however, last night I was totally inspired to work on this project. Sometimes you just need to set projects aside and work on the things that you feel like doing ~ so that's what I did. Several weeks ago, I found this cool notebook at Target. It has 3 tabbed dividers with these fun curved pockets. I knew immediately that I wanted to use it for card, layout and project sketches. I have used other peoples sketches for years now, like my sweet friend Michelle Wooderson ~ she does amazing work! However, over the last several months, I have started doing a lot of my own. I ended up with slips of paper all over the place so I decided that I needed one place to write everything down. 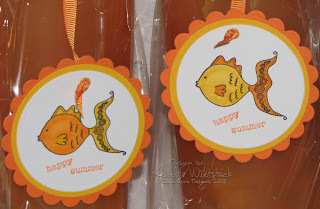 Supplies Used: Stamps ~ Stampin' Up! 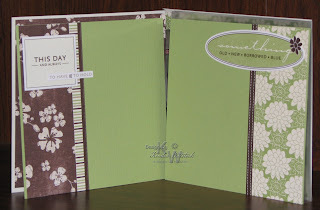 & Hero Arts; Cardstock & Pattern Paper ~ Stampin' Up! ; Ink ~ Stampin' Up! & Palette Black; Chipboard Letters ~ Stampin' Up! ; Ribbon ~ Bo Bunny & May Arts; Trim ~ Doodlebug; Punches ~ Stampin' Up! ; Charm ~ Unknown. Don't worry if you didn't win this time ~ I'll do it again. 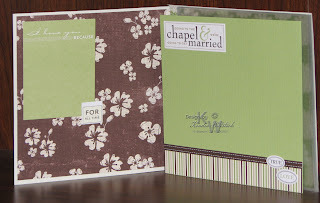 Supplies Used: Stamps ~ Lizzie Anne Designs; Cardstock & Ink ~ Stampin' Up! ; Ribbon ~ May Arts; Embossing Plate ~ Cuddlebug. You know I just love this color combo ~ red, orange, and hot pink! What great summer colors. I know some of my friends have trouble working with the bold bright colors, but I love them ~ especially this time of the year. Supplies Used: Stamps ~ Lizzie Anne Designs (Blissful Blossoms, In the Background, Sketched Sentiments); Cardstock ~ Stampin' Up! ; Ink ~ Stampin' Up!, VersaMark, Palette; Ribbon ~ Doodlebug (with the black thread removed); Glitter ~ Stickles. WOW ~ I've been messed up on what day it is all week long! It's been a very busy week but it's Friday right? Well thank goodness! I hope ya'll have something fun planned this weekend. I am taking Megan (age 11) to get her ears pierced. She has been asking for the past year and I made a deal with her. She did a great job of keeping up her end of the bargin, so now it's my turn. She's a little nervous, but very excited. I'm sure she will spend most of her weekend looking in the mirror and searching the internet for cool earrings. 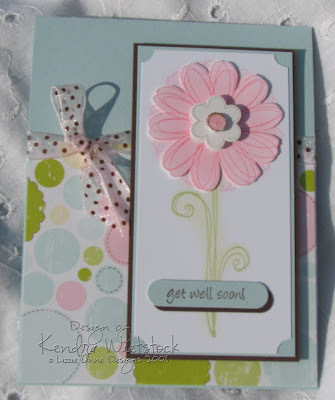 Supplies Used: Stamps ~ Lizzie Anne Designs (Blissful Blossoms, Simply Sentiments); Cardstock ~ Stampin' Up! 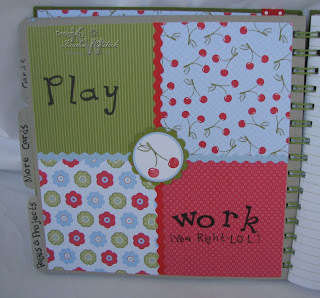 ; Pattern Paper & Stickers ~ Making Memories; Ink & Chalk ~ Stampin' Up! 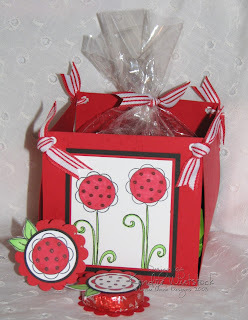 ; Ribbon ~ May Arts; Word Window Punch & Ticket Corner Punch ~ Stampin' Up! Hey look ~ these projects match my blog! These projects are posted today in honor of my friend Michelle's birthday. She love polka-dots! Happy Birthday sweet MY ~ I hope your day is FANTASTIC! This was a fun little project to make using a Lizzie Anne Designs set called Blissful Blossoms. There are lots of different floral images in this set along with a bee and a butterfly. ETA: What's inside ~ chocolate of course! 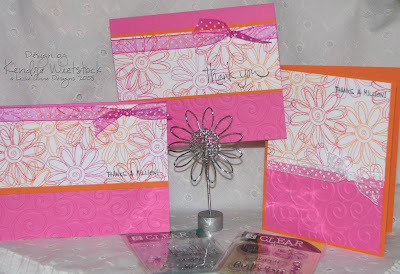 Supplies Used: Stamps ~ Lizzie Anne Designs (Blissful Blossoms & Sketched Sayings); Cardstock ~ Stampin' Up! ; Ink ~ Palette Black & Copics; Ribbon ~ May Arts & Stampin' Up! ; Punches ~ Stampin' Up! I thought I would share a few pictures of one of the baby albums I've been working on. I have two for baby girls and two for baby boys. These are 6"x 6" scrapbooks and all the pages are in page protectors. They are the same layout as my Summer Days album that I made last month. Since these will be for sale, I obviously haven't put pictures on them. However, I did leave plenty of room to add wallet sized photos and journaling. I think these will make great shower gifts or gifts to take when visiting a new little one. 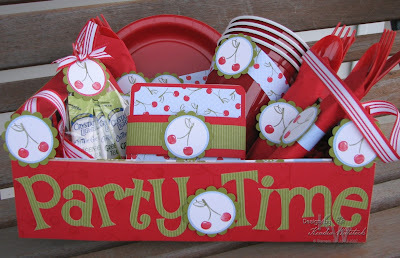 Supplies Used: Baby Girl Scarpbook kit, Groovy Guava Ribbon, and scallop circle punch all by Stampin' Up! I have to say that I think this new Lizzie Anne Designs set called Born to Be Wild is ADORABLE!!! There are four sweet little animals with both the solid image and an outline. There are also some great sentiments and a palm leaf. I'm not sure why, but I have been making a ton of baby stuff lately (and NO ~ you don't have to ask). Today I finished four 6x6 scrapbooks that I will be selling & tonight I started another book that someone hired me to do using this cute set. 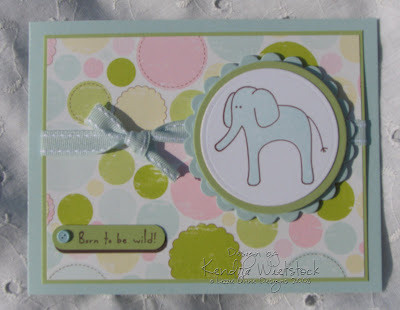 Supplies Used: Stamps ~ Lizzie Anne Designs (Born to Be Wild); Cardstock ~ Stampin' Up! 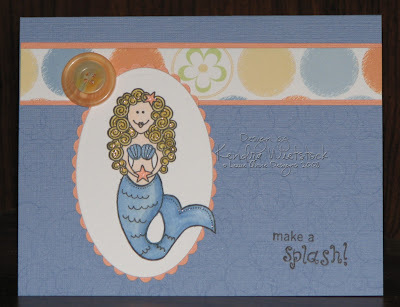 ; Pattern Paper ~ Making Memories; Circles & Scallops ~ Nestabilities; Punch ~ Stampin' Up! 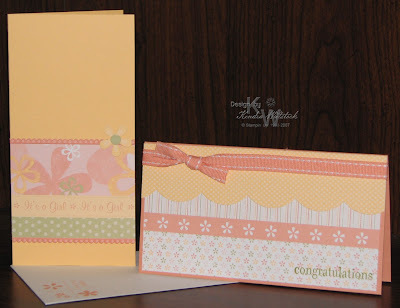 ; Ribbon ~ Stampin' Up! ; Brad ~ Unknown. I was playing with this paper last week and came up with this super simple card. I like this spring line by Making Memories ~ it comes with cute Easter things and spring flowers. I thought it would also make cute baby cards (which I'll have one to show soon). 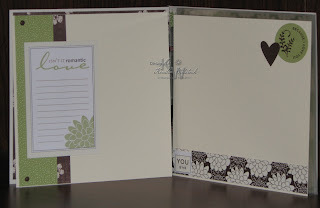 Supplies Used: Stamps ~ Lizzie Anne Designs (Sketched Sayings); Cardstock ~ Stampin' Up! ; Pattern Paper & flower ~ Making Memories; Punch ~ Marvy; Ribbon ~ May Arts. My friend asked me if I would make a sympathy card for her to give to someone. Her friend had just lost her beloved little dog and was so upset. I know all too well how much I miss my sweet babies that have passed. However, as much as it hurts to lose them, I would never trade the years and precious memories I have with each of the dogs and cats that I have owned throughout my life. 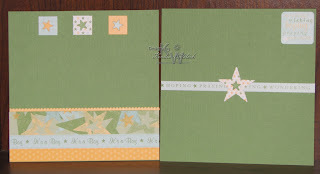 Supplies Used: Stamps ~ Hanna Stamps (Best Friends) & Stampin' Up! 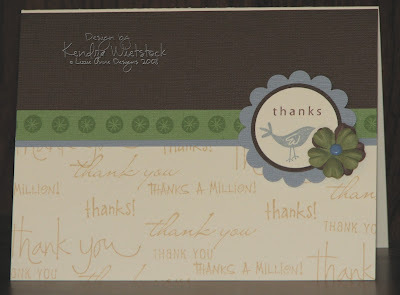 (sentiment); Cardstock ~ Bazzill; Pattern Paper ~ KI Memories; Ink ~ Palette & Copics; Punches ~ Stampin' Up! ; Twill ~ Unknown. Anybody up for a picnic? 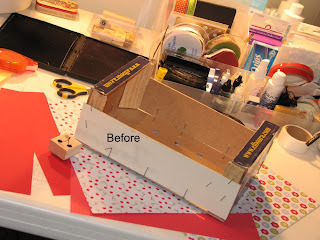 My husband issued a challenge to me ~ could I do anything with this old Clementine box? HA! Silly man ~ Of course I can! I made this a few months ago and submitted it to a few publications, but I think it was too late in the cycle for the summer issues ~ oh well. Even though most of the supplies are Stampin' Up!, I'm not gonna send it in to them because (1) I would have to mail it to them, (2) I won't get it back, and (3) I used a Cricut alphabet rather than stamps (and I am NOT revising it). Anyway, I was pleased with how it came out. Supplies Used (All Stampin' Up! unless otherwise noted): Stamps ~ Tart & Tangy; Textured Cardstock ~ Real Red, Old Olive, Bashful Blue & white; Pattern Paper ~ Summer Picnic; Scallop & circle punches; Real Red Striped Grosgrain Ribbon; Ink ~ Real Red & Old Olive; Cricut Cartridge ~ Alphalicious by Provo Craft. These are the photos I took a few weeks ago right in my own backyard & I couldn't wait to get them on a page. The other day my friend (who also lives here in my neighborhood) was looking at my pictures, and asked "Where do you live?". She had no idea where in my backyard I would have taken these pictures. I thought that comment was so funny. Supplies Used: Cardstock ~ Bazzill & Prism; Pattern Paper ~ Basic Grey; Ribbon ~ Michael's; Flowers ~ Prisma; Scallop Scissors ~ Fiskers; Cricut with the Jasmine Cartridge; Brads, Glue Dots & Glitter ~ Stampin' Up! I finished this a few weeks ago as an assignment for Lizzie Anne Designs. It was a fun little box to put together & went fairly quickly too. Yes, I did manage to get my Mother's Day packages in the mail yesterday to my mother-in-law and my step-mother. My mom has been gone a few years now, so I feel blessed to have other special mothers in my life. Paint all of the edges of coaster box and 4 coasters with acrylic paint. Make sure you cover both sides of the coaster. Set aside to dry. 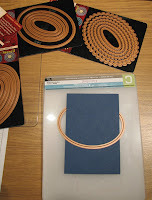 Using 2 or 3 pieces of coordinating pattern paper, measure and cut paper to cover the coaster box. Attach the pattern paper using adhesive from a Xyron machine or Modge Podge. On the lid of the coaster box, use an eyelet hole punch and a hammer to punch 2 holes in the center. Thread a ribbon from top to bottom and tie a knot on the bottom. Make sure you leave a loop on top for the handle. 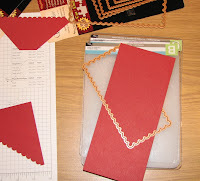 Using a rectangle die, cut out a scallop rectangle (approx. 2 3/4" x 3 3/4") in white cardstock and ink the edges with coordinating pink ink. Using the Blissful Blossoms stamp set, stamp the flower stem in green ink, the butterfly in orange and the Wonderful Mother Simply Singles stamp in pink ink. 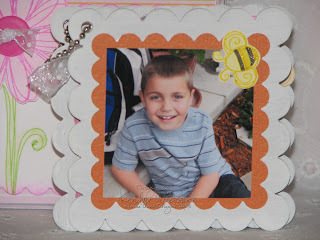 Use coordinating chalk to add more color to the stamped images and attach the rectangle to the front of the coaster box. 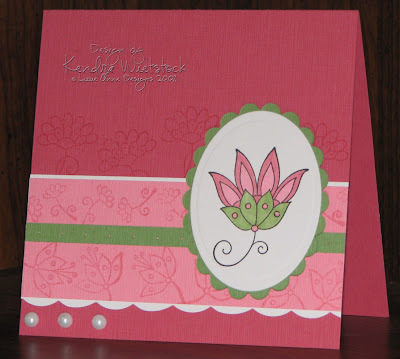 Using a separate sheet of white cardstock, stamp another orange butterfly and a flower in pink. Again, use chalk to fill in color and then cut them out. Attach the flower with a Pop-Up Glue Dot or a foam dot. 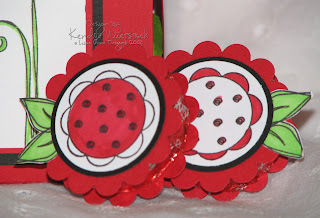 Add a coordinating button and a knotted piece of ribbon to the center of the flower. For the butterfly, carefully fold the image in the center and attach it over the stamped butterfly with a glue dot. For the Coasters: Pick out 4 coordinating pieces of textured cardstock and cut out a 2 1/2" scalloped square from each color. Attach each square to one coaster. Add a 2 1/4" square picture to three of the coasters. On white cardstock, stamp an image from the Blissful Blossoms stamp set for each coaster (flowers, leaves, bee, butterfly, etc). Stamp them in different colors and then add chalk to fill in more color and a touch of glitter. Cut out each image and attach it to the coaster. On the top coaster, stamp a sentiment using the Olivia Alphabet. 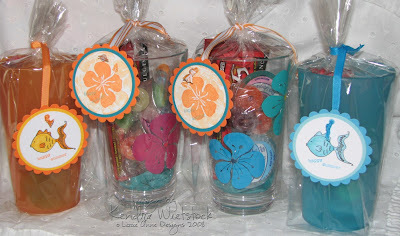 Attach the coasters with a ribbon and/or the beaded chain. Pop the coasters inside the box & you have the perfect gift for Mom or Grandma. I really need to get packages in the mail today so they won't be late! That would be just like me, I have everything made for months and months and then I mess up and don't get them mailed on time! 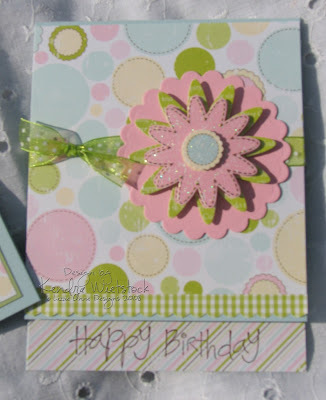 This spinner card has been made since February (or maybe even earlier) as a Lizzie Anne Designs assignment. It was a fun card to make, but it was not an easy 10-minute thing. I'll have another Mother's Day creation tomorrow. 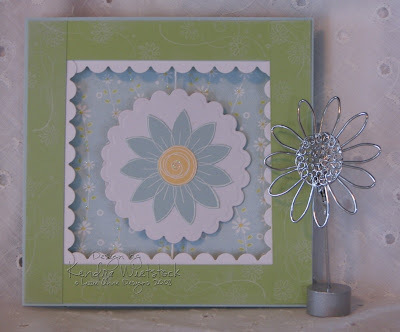 Supplies Used: Stamps ~ Lizzie Anne Designs (Single Sunflower & Wonderful Mother & Flower Frenzy set); Cardstock ~ Stampin' Up! & Papertrey Ink; Pattern Paper ~ Imaginace; Ink ~ White Craft Ink (SU); Nestabilities Dies. Yup...I'm still at it & having a ball! Don't worry card makers, I'll get back to more of those soon ~ but for now, I'm having way too much fun. Here are some pictures I took last fall at the Elkhart County 4H Fair. We are fortunate enough to have one of the best county fairs in the country right here in Indiana ~ it's absolutely HUGE! 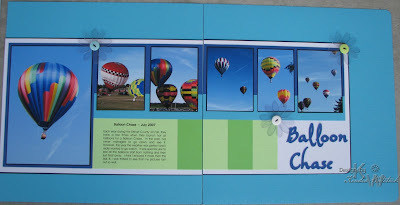 Each year one of the activities is a balloon chase and last year I finally was able to go. It was amazing to watch & I was thrilled with how bright and colorful the pictures turned out. I told you I've been scrapbooking! Here is another layout I made this week. 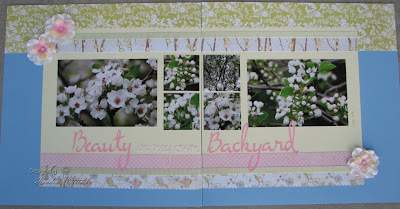 It is a complete CASE of a layout I saw in the May/June issue Scrapbooks etc magazine. The layout in the magazine was done by Kelly Noel & it was just beautiful ~ I copied pretty much everything ~ even the paper. Why change perfection? 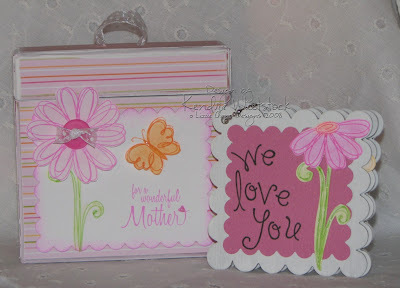 Supplies Used: Cardstock ~ Bazzill; Pattern Paper ~ Scenic Route; Cricut Cartridge ~ Jasmine; Ribbon ~ Stampin' Up! ; Smile tile ~ KI Memories. 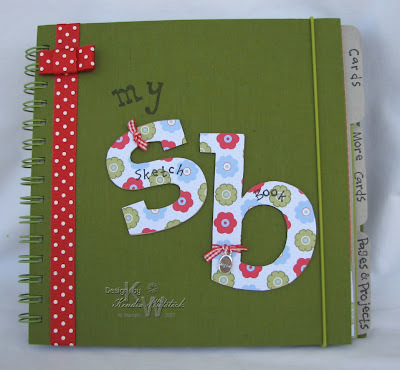 National Scrapbooking Day... It's TODAY! It's pages and memories like this that remind me why I love to scrapbook! Tim was out of town for his birthday last year so we tried very hard to make a day special when he got home. We told him we were going to have a party but he didn't know any of the details. We went to friends house for dinner, swimming a Cold Stone Ice Cream Cake, and PRESENTS. We surprised him with a Wii ~ he was so HAPPY! I love these pictures because the expression on his face shows how happy he was that night. I hope all you scrapbookers out there have a chance to get some projects done today. I have had a wonderful time this week working on some 12x12 layouts. It has been MONTHS ~ maybe even a year, since I have sat down to really work on pages. I've done a project here and there, but I haven't dedicated a good chunk of time to doing pages. So this week I carved out some time to work on some fun pages. One thing that has really helped me with my scrapping guilt, was to make the decision to scrapbook what I love and not worry about working chronologically. It has taken a lot of pressure off & is very liberating. Remember ~ it a hobby, so have fun with it. 1) I went thru idea books and picked out 8 to 10 layouts that I just loved. 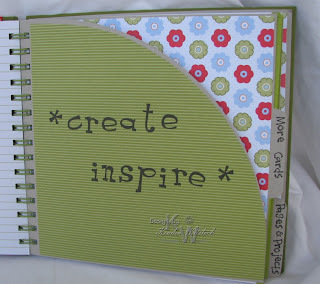 My new favorite idea book is by Becky Fleck called Page Maps ~ it is a fantastic book! She also has a great website and uploads new layouts each month ~ go check it out HERE! 2) Using the layouts I picked out in the idea books, I then went thru my pictures on the computer and decided which events (or just everyday things) I was in the mood to scrapbook. When I upload my digital pictures to my computer, I organize them by year and month so they are easy to find. For the page above, I picked out my favorite shots of my husband's birthday from last year. 3) Using the layout from the idea book and the pictures I wanted to use, I decided on which pictures from that event I wanted to print and what size to print them. I have a photo printer at home that will print a variety of sizes, so I usually don't print too many because I never use them all. 4) Now that I have my layout idea and my pictures are printed, I figure out what paper and embellishments to use. That part usually takes the longest for me. If I end up taking too long, I usually just start laying down things and deal with what I don't like later ~ LOL! So that is usually my process ~ Happy Scrapping! Supplies Used: Cardstock ~ SU Textured & Prism; Pattern Paper ~ SU; Ric-Rac ~ May Arts; Photo Anchors ~ Queen & Co.; Title ~ Cricut (Base Camp cartridge); Chipboard star and button ~ SU; Font ~ Avant Garde (Word); Swirl Punch ~ Marvy. I had a wonderful time shopping at the local scrapbook store the other day with my girlfriend Paula. We found all kinds of great pattern paper (among other things). When I found these fun patterns, I knew I wanted to use them for the new Hanna summer sets. 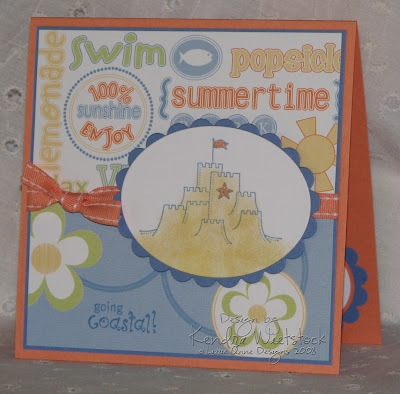 This set called Fun in the Sun, is now available over at Hanna Stamps. Supplies Used: Stamps ~ Hanna Stamps (Fun in the Sun & Things Hanna Would Say); Paper ~ Prism; Pattern Paper ~ 3 Bugs in a Rug; Ink ~ Palette & Copics; Ribbon ~ Michael's; Dies ~ Nestabilities; Scissors ~ Fiskars (Corkscrew). Now that warm weather is approaching and those Red, White & Blue holidays (Memorial Day & the 4th of July) are approaching, it's time to get the BBQ our and invite some friends over. 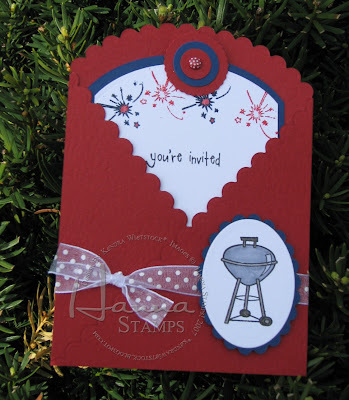 This is the new Patriotic set from Hanna Stamps that will be out this Friday, May 2nd (at midnight). Not only did I get to play with new stamps this week, I also got to play with my new Nestabilities (long ovals) and Megabilities (long rectangles) by Spellbinders ~ WHAT FUN!!! I purchased them from Ellen Hutson ~ GO over and check them out!!! For the scallop top of this pocket I used the large scallop oval and for the curved edge, I used two of the ovals that nest. Then for the pocket I used the long rectangles and put two pieces of cardstock together at an angle & cut them at the same time. Supplies Used: Stamps ~ Hanna Stamps (Patriotic Set); Cardstock ~ Prism & Papertrey Ink white; Ink ~ Palette, Versafine Pigment Ink & Copics; Megabilities & Nestabilities by Spellbinders; Circle punches ~ SU; Brad ~ Queen & Co; Ribbon ~ May Arts.